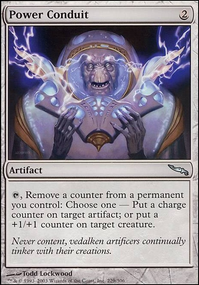 Whenever an opponent plays a spell, counter that spell and put a depletion counter on Decree of Silence. 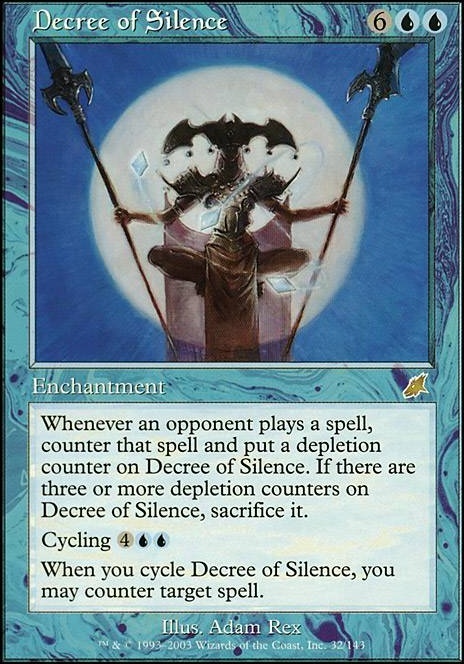 If there are three or more depletion counters on Decree of Silence, sacrifice it. Since you're running Solemnity , consider Decree of Silence over Counterbalance . 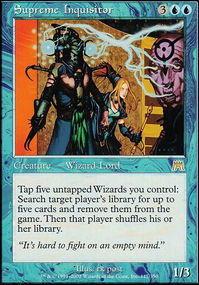 If you're running Guile in a stax deck, you should be running Dovescape . If you're running Solemnity , you should be running Decree of Silence . 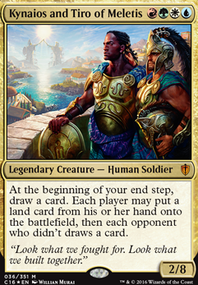 Knowledge Pool and Omen Machine are also ridiculous stax pieces with your commander. With Grand Arbiter+Pili-Pala combo, you should probably run some X draw spells. Blue Sun's Zenith , Sphinx's Revelation , and Pull from Tomorrow are your friends. 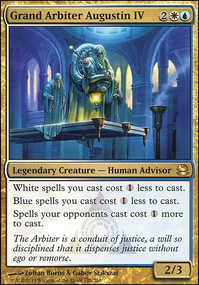 If you want to make that a central part of your game plan, Isochron Scepter + Dramatic Reversal is an easy one to run, and Muddle the Mixture is a good budget tutor for both pieces that has utility, as well as being able to get Pili-Pala and Pull From Tomorrow. 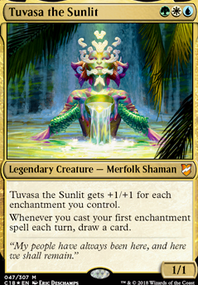 You can then win on that turn with Approach of the Second Sun. If you're going to run a bunch of Armageddon effects, I would also run Faith's Reward . Terramorphic Expanse and Evolving Wilds are bad in 2-color decks. Literally any dual land is better. Boreal Shelf and Coastal Tower should be in there before Expanse and Wilds. NetholonTheArchmage, I agree on all of your points! I think I will work in Decree of Silence (as well as some fetch means). Regarding Null Chamber one other thought was that it could be used politically to provoke enemies into one another. Agree with an opponent to not choose anything of the other persons, and then you choose something rather neutral. Then if your opponent names someone elses commander, win con, whatever... They COULD be portrayed as the antagonist of the prohibited player rather than you. Obviously this would depend on how well you could predict your opponents spikeyness as well as the response of the "offended" player in where they place their blame. @ MCJennings , I can see the problem you have with Venser here... I do have the same problem and usually use him as a wincon only --> blinking the Illusions of Grandeur to gift it multiple times. That is unless I can protect him with the Sphere of Safety I have in my list. Thanks for the comment and suggestions, NetholonTheArchmage! 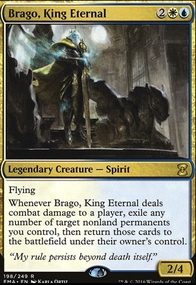 I do see the utility in Venser, but when testing him in the past I found that opponents in my playgroup would be irrationally aggressive towards any and all planeswalkers. If he had immediate value then it would work well, but I'd typically want to donate whatever nasty thing I took back asap- meaning I'd require at least 8 mana. I think Remora would be a useful choice early game, and very effective with Solemnity. What are your thoughts on Decree of Silence , Pendrell Mists , and Null Chamber ?